At the start of rainy season, I’m trying to navigate Kyoto Station to store my luggage for a day trip to Nara Japan. I manage to find the storage lockers but run into another snag. The coin lockers take 100 yen coins and require exact change. Of course I’m out of 100 yen coins. As I frantically look around for a change dispenser, a kind stranger hands me a coin. When I try to pay him back, he waves his hand and refuses to accept my change. Japanese hospitality at its finest. Nara isn’t the oldest capital of Japan, but it is older than Kyoto and Tokyo. 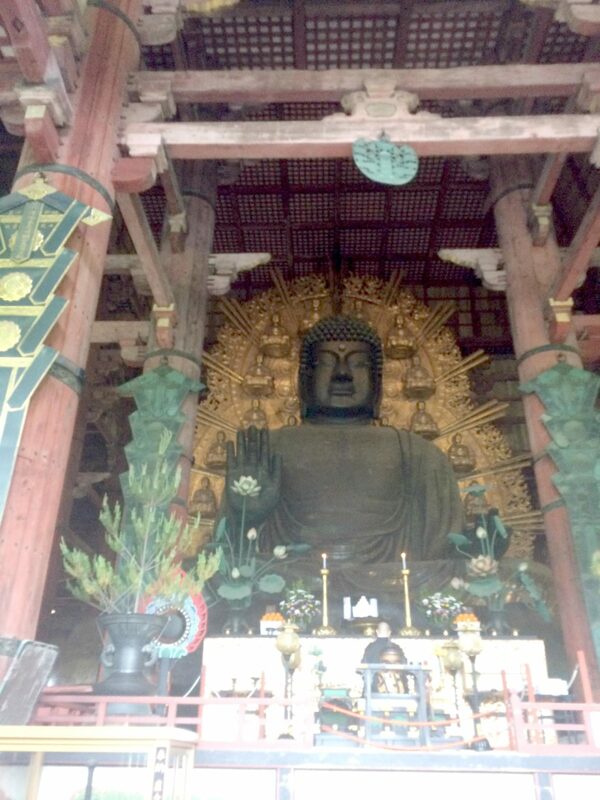 Importantly, it was the capital when Buddhism began flourishing in Japan. If you want to see a really impressive Buddha statue, you need to visit Nara. One of the most famous temples in Japan, Todaiji, sits in Nara Park. Todaiji is a huge temple. In fact, the temple complex includes the world’s largest wooden building. To get to Nara you have two options. JR Pass holders can take the Japan Rail line from Kyoto to Nara Station. From there, the walk to Nara Park takes twenty minutes. If you don’t mind spending money, take the Kintetsu train line from Kyoto to Kintetsu Nara station. The walk from Kintetsu Nara Station to Todaiji takes five minutes. The walk to Todaiji will take you past Kofukuji Temple as well as several restaurants and shops. Nara prefecture is known for its matcha tea. Several shops sell matcha powder. Even better, try matcha udon noodles. Nara Park hosts two Buddhist temples (Todaiji and Kofukuji), Kasuga Shrine, and countless deer who live in the park’s 1600 acres. 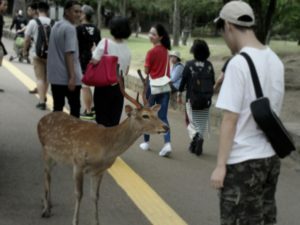 The deer aren’t afraid of humans and often beg for food. I was nearly cornered by a deer determined to share my Sakura (Japanese cherry blossom) flavored ice cream. If you choose to feed the deer, it’s important to remember that they are wild animals and can and will injure humans if provoked. You can’t miss Todai-ji. The temple is the world’s largest wooden building. Impressive is an understatement. Even more impressive is that the current structure, which dates to the 18th century, is 2/3 the original size of the original building. 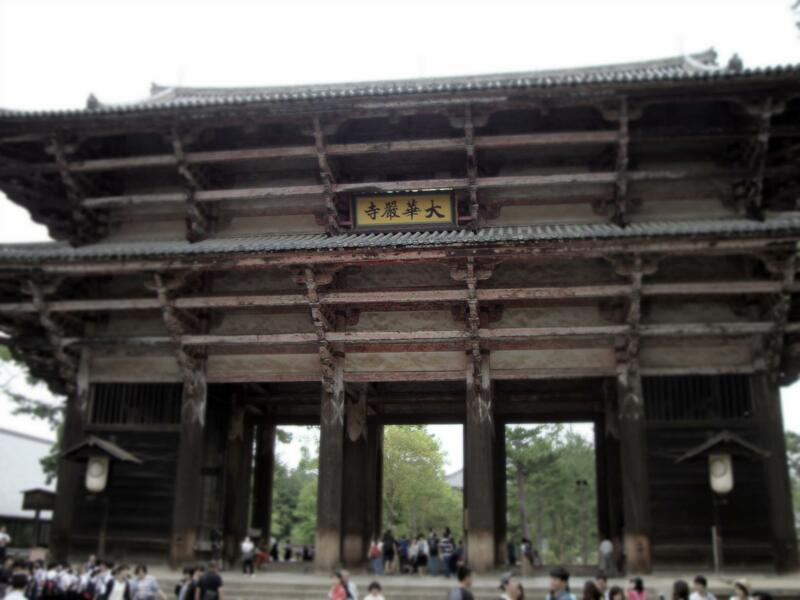 The temple began constrution in 728 when Nara was the center of Buddhism in Japan. In its early history, the temple was the headquarters of six different Buddhist schools. 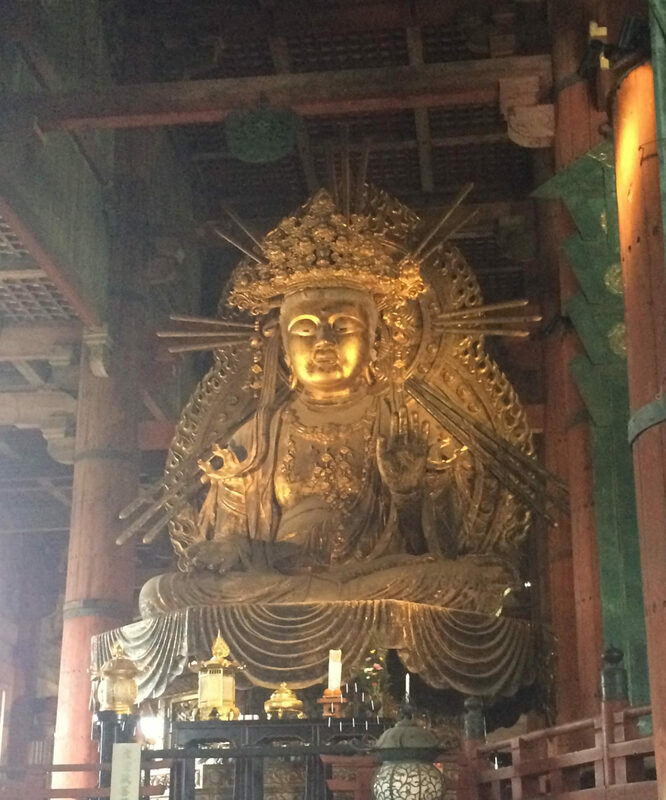 Todaiji houses the world’s largest bronze stature of the Buddha, the Daibutsu. The construction Daibutsu involved most of Japan. The statue is over 15 meters (50 feet) tall and was cast from 400 tons of bronze. The Daibutsu represents the cosmic Buddha. The Daibutsu is flanked by two slightly smaller gold statues, Kokuzo Bosatsu , the boddhisattva of wisdom and memory, and Kannon Bosatsu. 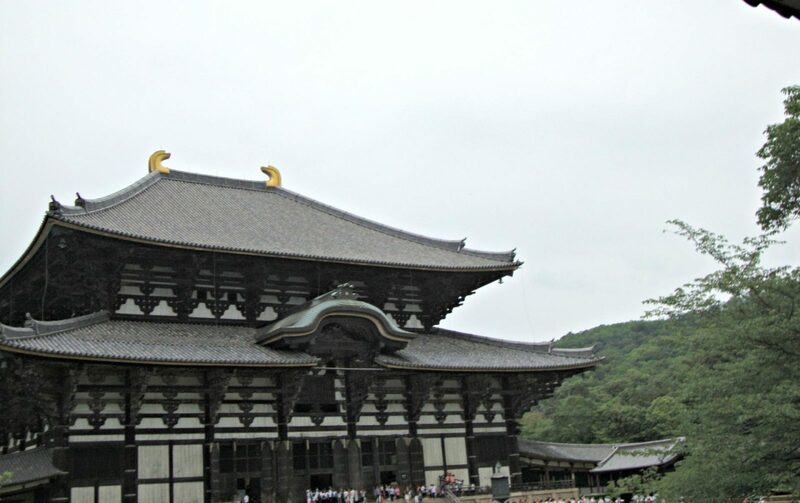 Because of the growing power of the temple, the court decided to move the capital away from Nara. 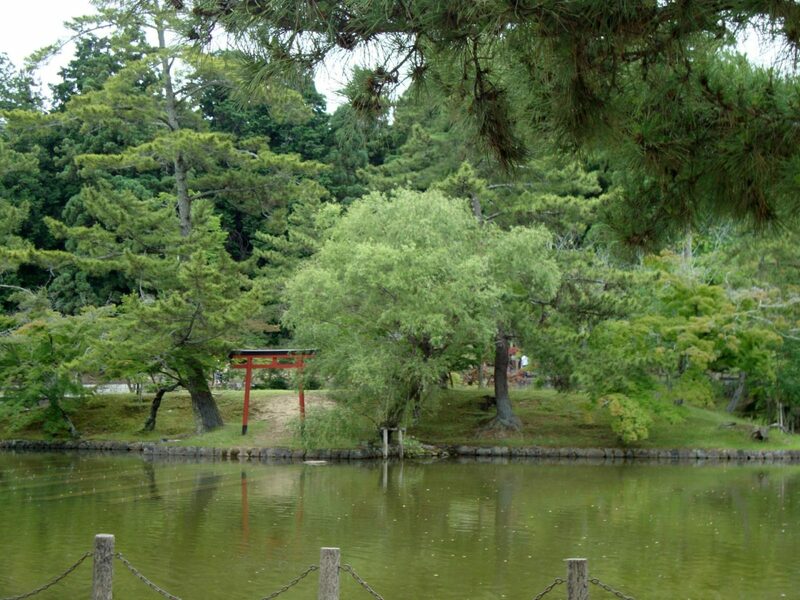 Along with the statue, the temple has large gardens including a lake. The lake is a great place to relax and enjoy a snack from any of the stalls lining the road to the temple. Heading back from Todaiji, I took the time to stop at Kofukuji Temple. I didn’t regret it. Kofukuji is the second of the “big three” Buddhist temples in Nara. 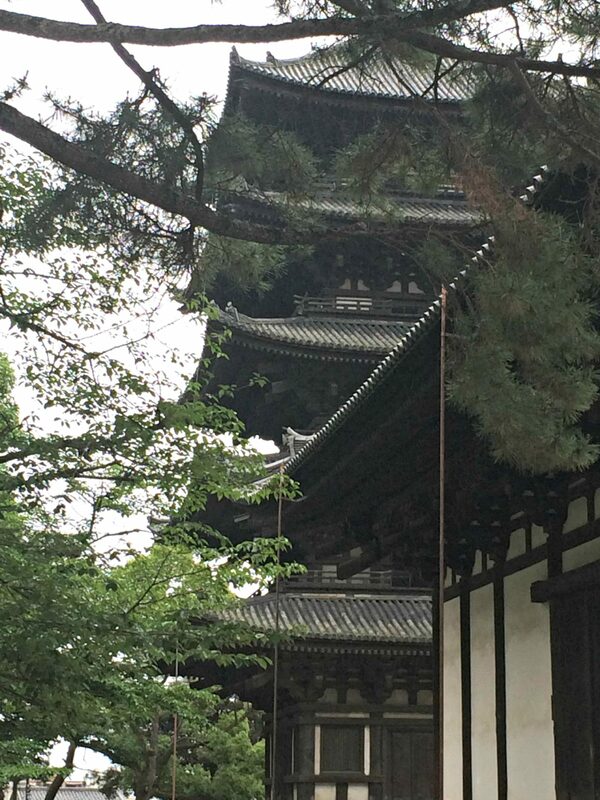 The temple is easy to find: look for the pagoda which is the second largest in Japan. Kofukuji has a colorful history. The temple was the family temple of the Fujiwara family which was one of the most important families in ancient Japan. One of my reasons for visiting was the Tale of Genji connection. Murasaki Shikibu, the author of the Tale of Genji, is thought to have been a member of the Fujiwara family. Kofukuji is the head temple of the Hosso sect of Buddhism. At the height of the temple’s power, the temple complex contained over 150 buildings. Most of the current buildings date to the 12th-18th centuries. Tokugawa Ieyasu, the general who unified Japan, paid for the restoration of several of the buildings. The museum at Kofukuji has one of the best collections of Buddhist sculpture in the world. I do recommend doing background research before visiting. Many of the sculptures have detailed Japanese descriptions but the English commentary is basic. Having a basic understanding of Buddhism will make the visit more interesting. 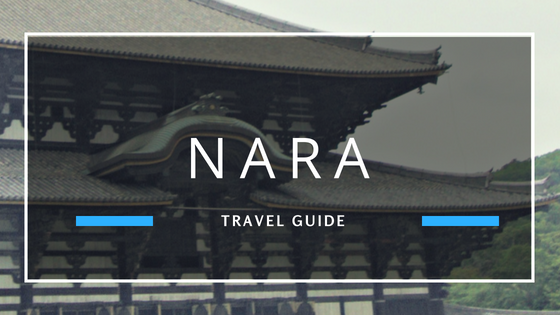 Have you been to Nara? What are your must-see attractions? 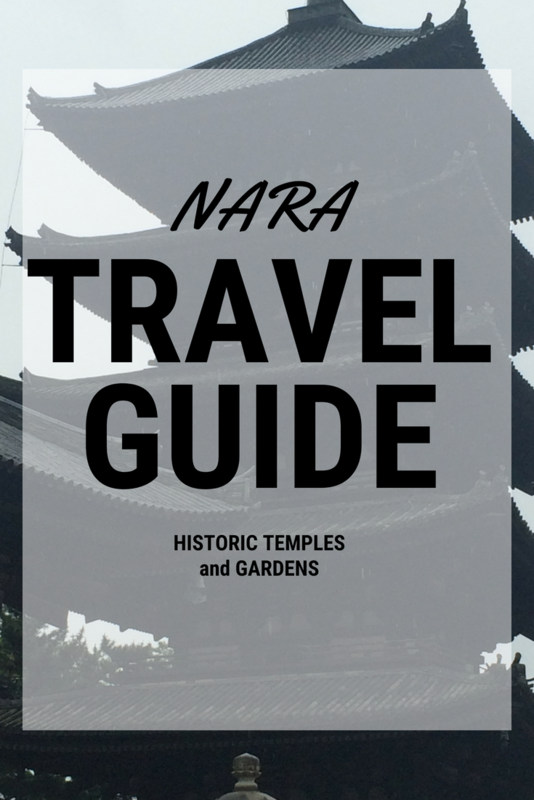 Are you planning a trip to Nara? Let me know in the comments!